Petr Stepanek was Phantoms man-of-the-match. 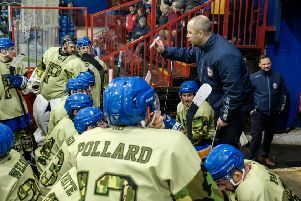 Coach Slava Koulikov insisted there were positives to take from a heavy defeat on a night when Peterborough Phantoms had five senior players missing. The city side went down 6-1 at reigning champions Basingstoke yesterday (January 7) when without netminder Janis Auzins, defencemen Tom Norton and Ben Russell, and forwards Marc Levers and Will Weldon. Koulikov turned to the club’s feeder side, Islanders, to boost his ranks with Callum Medcalf and Nathan Long – the younger brother of netminder Adam, who replaced Auzins – operating on ‘D’ while frontmen Brad Moore and Connor Stokes were also involved. Given the absence of so many senior men, the final scoreline was altogether predictable, but Phantoms gave their hosts plenty to think about before being seen off by a flurry of late goals from a Bison outfit led by four-goal import Rene Jarolin. They fell behind to an early Jarolin shot through traffic before the hosts increased their advantage with two goals in the space of three minutes in the second period. Defenceman Declan Balmer doubled their advantage before Jarolin struck again three seconds after the mid-point of the contest. James Archer fired Phantoms back into contention after being fed by Wehebe Darge, but they were unable to mount a comeback. And three further Basingstoke goals in the final 10 minutes completed their march to victory. Jarolin pounced on a powerplay rebound to complete his hat-trick before lighting the lamp again even-handed. Another Bison import, Tomas Karpov, completed the scoring on another powerplay with just over three minutes to go. Koulikov said:“We just had a run of five games in eight days from Boxing Day to last Monday and some guys picked up small knocks. “We’re not going to take risks with anyone as we don’t want them to turn into bigger injuries. “We already have ‘Welds’ out longer-term and ‘Leves’ is playing the odd game when he can while waiting for an operation. “But it gives us the chance to evaluate guys from Islanders. I receive regular reports on them and it is good to be able to give them a chance to ice in the EPL. “Bringing through our own young players is very important to everyone involved in the organisation. “It is always going to be a tough night in Basingstoke regardless of whether you turn up with a full roster or have people missing. “I was really encouraged by our performance. We were the better team in the second period and that is a huge achievement in itself. Two points will definitely be the target today (January 8, 5.30pm) when Phantoms entertain Sheffield for the third time in a week. They beat the Steeldogs 10-2 and 6-1 on successive nights to see in 2017 in prolific style. Koulikov will make late decisions on whether or not Auzins and Norton are able to play, but the concussed Russell will certainly sit out again.